Deep thought and some additional core SUSE Linux Enterprise source code have given The openSUSE Project a path forward for future releases. The change is so phenomenal that the project is building a whole new release. 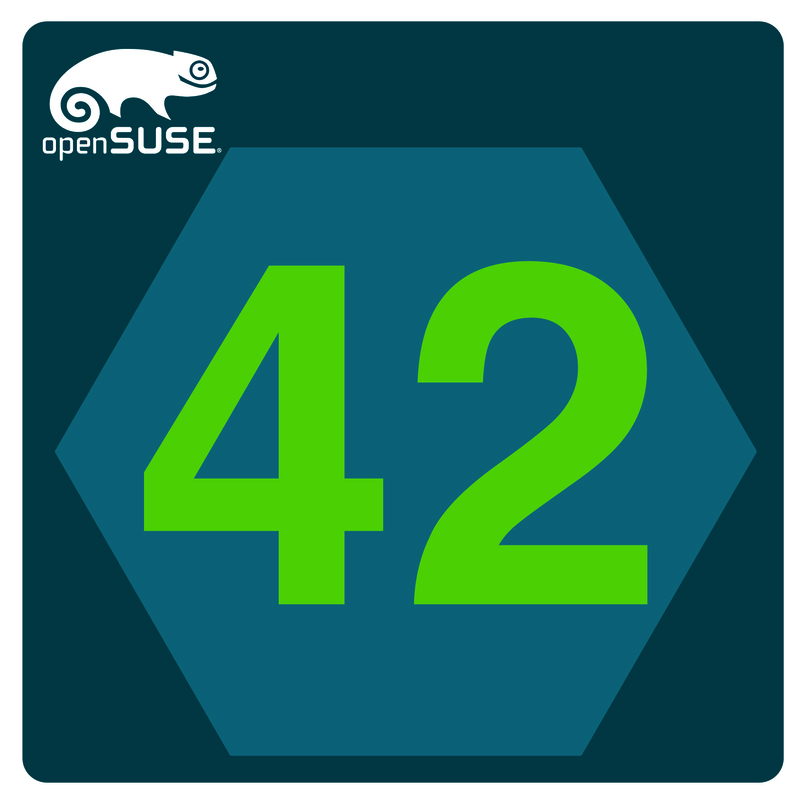 Some people might be perplexed over the next regular release, but rather than bikeshedding the name over the next few months, for the moment, we will call it openSUSE: 42 after its project name in the Open Build Service. And we are going to explain the roadmap for this regular release. openSUSE 42 is scheduled to be released around SUSECon, which is in Amsterdam this year from Nov. 2 – 6. Unlike old releases, future releases of “42” are expected to align with the releases of SLE service packs and major releases. There are about 2,000 packages in openSUSE 42 right now, said Stephan “Coolo” Kulow, release manager. Of course, many more are expected. openSUSE 42 will be a long-term type release with enduring updates and maintenance commitments by the community and SUSE. Kulow said a milestone will be released soon. “We have to come up with solutions as problems arise,” Kulow said. There is currently no plans for live CDs, but he said expect other media formats to be added later. Plenty words.. but nothing about totally new.. new only on release date? O something will be dramatically improved ?? I vote for package quality. improvement. Looking forward to testing it. Will this be a new flavor of openSUSE or displace the current stream? However, I cannot really benefit from it, as I need the latest kernel (preferably 4.1 or newer) for proper hardware support. Still: Keep up the great work, tumbleweed looked beautiful the last time I tried it out. Ah and before I forget: Remember to support 32 Bit UEFIs please. The bootloader needs to be modified for this (obviously). Not many distros are able to boot on a 32 Bit UEFI machine yet, so far I’m only aware of debain being able to do so out of the box. It would be very nice to have support for this on OpenSuse too. It would be nice to drop OpenSUSE on these low-cost 64-bit tablets that only support a 32-bit UEFI boot. If is it new flavor like Tumbleweed, its ok. If is it replacement for openSUSE 13.3, it is very bad idea. (1) Include something like system repair (not system rescue) ow windows 7/8. Often it happens that just one/few files are corrupted and for that one has to do a re-install (of course after trying all bug fixing options by suse forum and goggling extensively to fix the problem unsuccessfully). It can be convenient if one can restore basic system to original state rather than doing re-installation. (2)Include some reliable simple imaging tool, so that if i install new opensuse and then install all required packages to make my system perfectly ready i can install – EXACTLY THE SAME SYSTEM- on other PC with identical hardware configuration. I am in India(where 90% os used is Windows) and I wish to be a sort of brand ambassador for opensuse by helping people to start using it. As i intend to do this free of cost as a volunteer, i can not afford to spare time to install it on several PC’s and make ready for them. (3)I think opensuse still lacks a reliable backup tool. The imaging tool i suggested in point 2 can also help as a backup tool. (b)Better tying up/ communication with various software providers. To give only two examples two excellent products:project FEDENA which is a school admin and HR system and ISPConfig which is an opensource alternative to exorbitant CPanel. Both these were originally available for all linux flavours but now their developers have started recommending ubuntu LTS. There may be several such products. Although i love opensuse i am seriously considering a switch to ubuntu. Thanks for a great OS anyway. Purpose of this post is not to criticize but to give feedback. Thanks. Agree on majority of your points except a few. The most agreed upon point is that of an imaging tool for Open suse. The most disagreed point is that Ubuntu is gaining because of marketing. Ubuntu has become popular because of user friendliness, its simpler process to install, try before installation, and far better community support which you can find on internet. Generally every issue you have on a Ubuntu desktop or a server has an answer in the first 5 googled results. The tools available for Ubuntu, because they are available for Debian, makes it more versatile. For any standard user, one does not need to add any external repositories. Many of the standard software one needs is available through the standard repos which are also available for debian. Nothing different for Ubuntu. Moreover Ubuntu had made it simpler to install using the software manager. The point I am trying to make is Ubuntu is simple to adopt than any other distribution with exceptions like Linux Mint. But by and large Ubuntu is enterprise ready, it is home use ready for not so geeks. It just works out of the box unlike many other distros. One of the major drawbacks I found in opensuse was font rendering. Ubuntu and Opensuse font rendering is world apart. Ubuntu fonts not necessarily the Ubuntu font, but all fonts in Ubuntu look nice and at par with apple or windows. The aliasing or pixelling or whatever they have done makes it look amazing. Linux Mint has gone one level up when it comes to font rendering. Getting the fonts to look better in opensuse is a pain and not something which can be easily managed by a new user. Out of the box fonts on opensuse are not at par. First impression on installing opensuse and opening a browser, one gets is why is it looking like this. OMG – I have to fix the fonts first. That is the first turn-off. 3. Make multi-monitor setup easy to configure. Right now when I use 4 monitors connected to two NVIDIA graphics card, I have to fix the display arrangement everytime I boot. 4. I dont know if it is an issue with my hardware config or opensuse, but the overall speed of opensuse feels slow. The system does not feel fast unlike Ubuntu or Linuxmint. I have a AMD 4 Core FX4100 processor with 16 GB RAM and 64 GB SSD only for OS. /home and other user data reside on separate 500 GB hard disks. Have two 1 GB display cards with 2 HDMI monitors and 2 DVI monitors. Please make this a super release, better than tumbleweed. Will love to see it coming out of my VM and running my primary computer. I would like a small footprint (32 & 64 bit) for an install over t’internet, rather than a 4.7 gig DVD image as 1st choice. I don’t need LibreOffice& gimp etc straight off in my install routine. They can be added once I have a stable KDE desktop. Areas of concern are Grub** and Wicked. Yast* is the best system on any distro I have tried, zypper works amazingly well also. I know it will be an excellent distro, and would like the naming/release convention to be year and month ie: openSUSE 1511. Please implement Systemd-Networkd in openSUSE 42. More security please, standard in the repos suricata, snort, and other nids applications so that intrusions can be blocked. Opensuse lacks security in mine opion. I use SuSE since 1997 (SuSE 5.3) sporadic ans since 2001 only, but I-m not a nerd. Use it only for my everyday life. Most interesting! SuSE (and even openSUSE!) has been my distro of choice for many years now! The “LTS” (Evergreen) version runs on several servers, with every client machine in my home (even the Mac!) having a dual-boot of openSUSE goodness. As of late, I’ve become concerned that openSUSE had lost it’s mojo (and it’s way! ), very quiet about the future. I didn’t see a plan/timeline for a 13.3/14.0 event horizon. I must admit that I didn’t quite understand the comment: “Deep thought and some additional core SUSE Linux Enterprise source code have given The openSUSE Project a path forward for future releases.” I assume that means that some SLE code/packages will be rolled in, aligning with SLE releases to offer new enterprise functionality? Unfortunately, I lack the visionary gene required to help visualize/plan openSUSE or Linux’s future. I very much enjoy openSUSE & Linux as a whole; the learning/tinkering, KDE desktops, building, support community, wide range of H/W support, etc – truly a fantastic product! How to make it better? a new FS? a snazzy font? different wallpaper/themes/candy? better UEFI integration? unification of security packages/functionality/configuration/tools? While that list could go on endlessly, openSUSE has already done much of the above in my opinion! Perhaps maturing the code base? I’m no expert on maturity, but the “LTS” distros have been very stable for me… “opensuse:42” – certainly sounds mature to me! This. “openSUSE 42 will be a long-term type release with enduring updates and maintenance commitments by the community and SUSE” is a sale for me. I love to play with Tumbleweed as much as the next guy, but I’m busy, Linux & SuSE are mature, desktop’s come and go, I’d love a release that just works, stays secure, is actively maintained, and isn’t blowing-up/dumping/versioning every 9mos! Whoops, I ramble! I like openSUSE, want to ensure that it continues on as mainstream distro, and am quite pleased to see that deep thought (and SLE input) are providing a way ahead for openSUSE! Best of luck! I look forward to seeing a new cyan bar on that timeline – as well as plan to get to “42” in November! I am so happy, for the first time in a over 7 years, that is APPEARS that development is focusing on a long term release version and getting the emphasis back on stability and quality; rather than pump out a new version because the calendar says so. The waste on resources just to pump a new version out could be well spend on core stability of a wide range or core components rather than add another 1,000 new apps to be available. For a long term tester and bug writer the most disheartening issue is for me is that the bug reports normally don’t get looked at or actioned until at lease 2 new versions have been released already. This waists my time and development’s as I’m sure there is a macro needed to go through the (normally) hundreds of still open bugs) and insert “sorry the version of the reported bug we no longer. If the bug remains please open a new one.” Sometimes its impossible just to change the version in the bug as log data changes especially at boot time. Having whats looking like a well thought out development strategy and a development manager who seems open to positive change, an unreal quality Manager and version release based on a stability premise tethered with innovation is unreal. Frankly I’m tired of hearing users excusing bugs and issues with the software, print drivers not being there, why the abort button in Yast (cant work Im told,) by the expression. I use OpenSuse for years as a personal and professional desktop and am very satisfied. Like others here, I was worried what will happen next with openSUSE because no timeline for the development has been more indicated. I hope you continues the development. – Not so many programs on the DVD, who uses already existing thousands? I really appreciate the OS as it has come a long way since I started using it about 5 years ago. With the introduction of Tumbleweed as a stable version a few years back, this did show me that this is an OS that has a future and a plan for newcommers to linux to feel more at home with linux. This new version of openSUSE 42 has had my curiosity on the highest level as I can not wait to see and use this new OS in action. I want to wish the team the best of luck on the new OS. On one side I can see some promising stuff here. On the other, I’m not sure I trust this. To be honest, and contrary to at least one opinion expressed so far, I would rather that openSUSE didn’t following the Poeterring herd toward further integration with systemd – I’m fed up with having to fix or work around broken code. If he really wants to develop a new OS, let him do it but leave Linux alone because he has bestowed upon us some of the worst code I can recall. As far as 42 goes, I’m not totally sure what to make of it yet as what is described here is hardly in depth but I really hope that the devs remember what happened during version 12 and properly test it before releasing it. Sticking to a published release date is all very well but if a product isn’t ready then you will get a lot less angry users if you delay it a bit than if you release another clunker like 12.1.